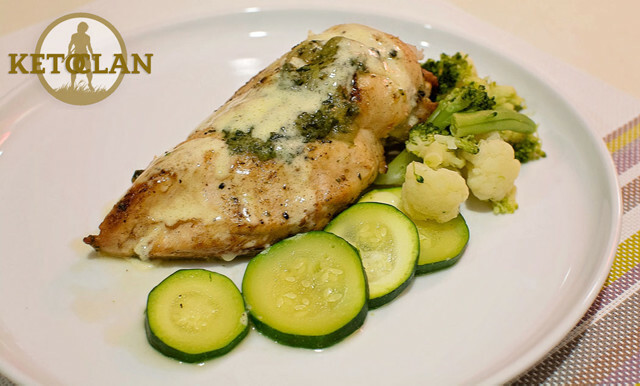 Stuffed chicken is the best! and this will leave you satisfied. 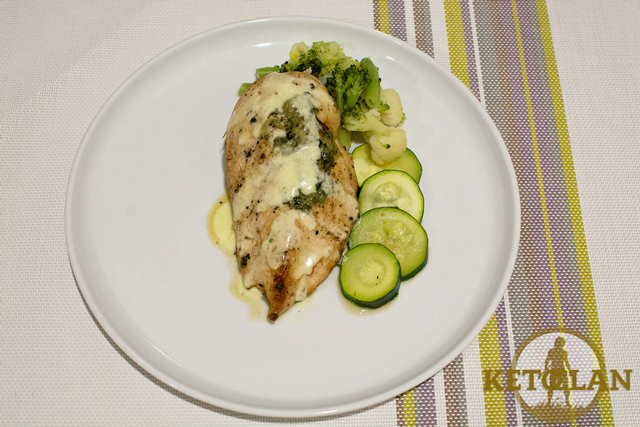 I love it you can mix it up by having different sides, adding a white wine sauce gives it a taste explosion. This is a little more fiddly and messy than most of the recipes on my blog but once you have made it a few times you become quite quick at it. Also just a little side note you can also make up the mixture divide it into four (or however many serves you are doing) shape it into a log and wrap it in some cling wrap stick it in the fridge for 30 or so minutes and this will make it firmer and easier to insert into the chicken. I personally never do this I’ve gotten used to the way I do it, but it gives you an option if you don’t like getting your hands all dirty. Let me know how you go cooking it. 1. Cook your spinach how you usually do (I cook mine in the microwave for a few minutes in my microwave steaming container) then add this to your mixing bowl. 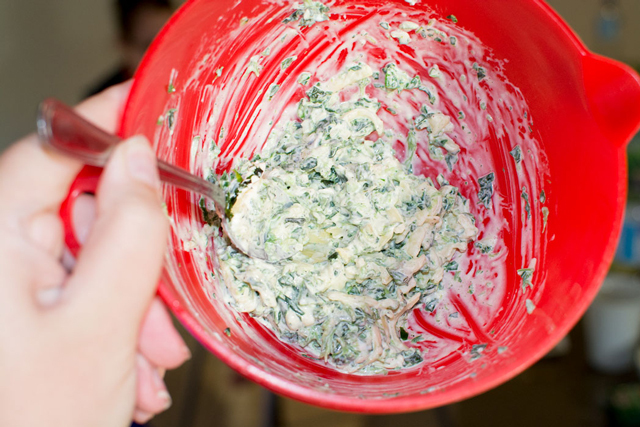 2.In the same mixing bowl add and combine your cream cheese, cheese, basil and salt and pepper. 4. 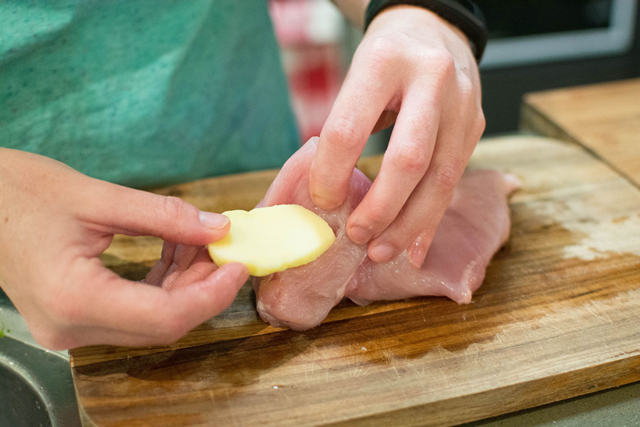 Have a look at the size of the slit in your chicken breast and then slice your mozzarella cheese to roughly the same size and then insert this into your chicken. 5. The next step is rather messy! 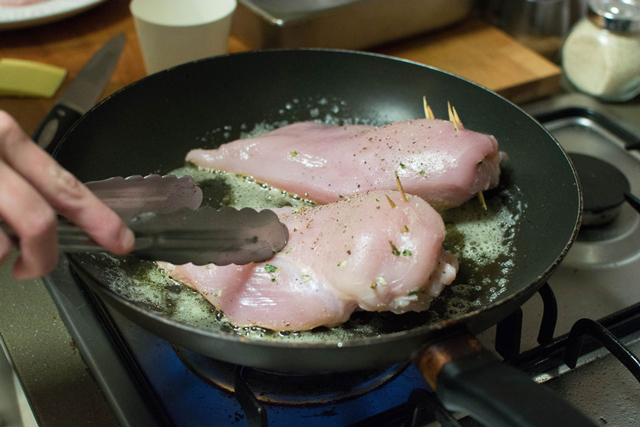 but the easiest way to get the mixture in the chicken breast is to put a small amount of mixture onto a teaspoon and insert this into the chicken and then just grab your finger and push the mixture down. (Dividing the mixture into 4 is a good way to know how much you need to put in each…obviously if you have a really small chicken breast you might not get it all in there.) 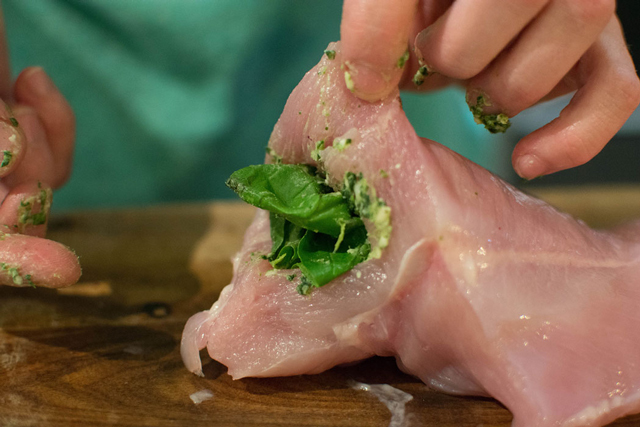 Once I have filled the chicken breast with mixture if I have any basil leaves in the fridge I will try and clog the end of the chicken with it so that when I put the toothpicks in and it’s cooking it doesn’t leak out. 6.Once you have filled the chicken you will need to put the toothpicks in. All your doing is trying to close the chicken breast so just push them into the chicken (basically stitch it back up) I average 3 toothpicks per piece of chicken unless I have made it slightly larger like in this photo and I used 4. Once you have put all the toothpicks in place these on a plate and sprinkle with salt and pepper. 7. 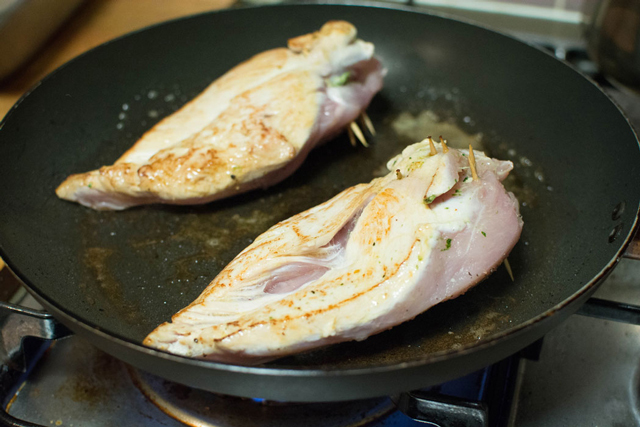 The next step is to get a frying pan and heat half of your butter place two of your chicken breasts in the frying pan and lightly sear on both sides. Once done transfer to an oven safe dish and repeat with the remaining chicken. Then place in the oven for roughly 30 minutes. You will have to judge the size of your chicken breast if smaller than my picture I would pull the chicken out in around 20 minutes and test it. You can serve this dish with anything you like. Steamed veggies coated in butter is my favourite but it is also nice served on top of cauliflower mash. Also it makes the dish if you serve it with a sauce of some kind, cheese sauce works well but lately I’ve been using a white wine sauce. for this amount of chicken I heat 1/4 cup white wine on the stove in a pan for 2-3 minutes and then add a cup of thickened cream to that stir for a further few minutes and then pour over everything. Enjoy guys. Yummy, saving this recipe. Thanks! Thank you for sharing! 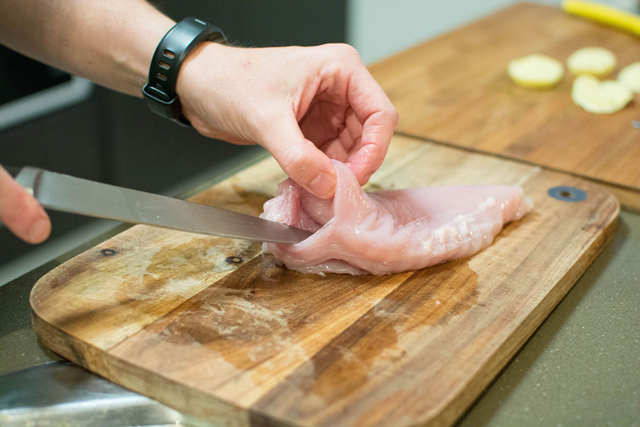 The pictures of how to stuff a chicken breast were very helpful.